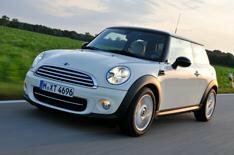 Face-lifted Mini Cooper D driven | What Car? The face-lifted Mini Cooper is now available with new a diesel engine that's more powerful than the unit it replaces, but cuts emissions and improves economy. Built from the unit used in parent company BMW's 1 Series, the new turbocharged direct-injection 1.6-litre engine has more power and torque than the unit replaces yet it also gives stronger performance, is more economical and has lower CO2 emissions. In the hatchback, that translates to average economy of more than 70mpg and CO2 emissions of less than 100g/km. That means a 13% company car tax rating and free road tax for private buyers. At low speeds, there's no hiding the tell-tale sounds of a diesel engine, but once you're up and running, things quieten down nicely. It combines well with the standard stop-start system, too, although again, there's no disguising the typical diesel engine shudder as it kicks back into life when you depress the clutch to move off. Generally, performance is strong, and the good pull in the mid-range (much more than in the old engine) means you don't have to rev the engine as hard as you do with the petrol alternative. That means the two engines have different characters. The petrol model is the more exciting and sporty because it needs to be worked hard, whereas you can be a little less frantic with the diesel. Rather than constantly revving it hard to keep the engine in its sweet spot, you can rely on the strong mid-range pull to haul you along at a perfectly acceptable rate. The only problem is if you let the revs drop much below 1750rpm. Amble round a tight turn in second gear, for example, and there's a distinct pause until the turbocharger wakes up. Other than that, though, it pulls strongly all the way to the redline not that you ever really need to get anywhere near that, though. Coinciding with the introduction of this engine is what can only be described as a minor face-lift. There are revised bumpers at both ends, as well as a new black cross-piece below the front numberplate and new-look lights at the rear. It might sound like a lot, but even when you park the new and old cars side-by-side, you'll be hard-pressed to spot the changes. They're subtle, to say the least. There are also new wheels and paint colours, as well as revised trims inside. Among the new options are adaptive headlights and Mini Connected, an in-car infotainment system that is controlled by Mini's version of BMW's iDrive and which works through an iPhone to give web radio, Facebook and Twitter updates, and a variety of other digital features. The big problem is that all these minor changes add up to a surprisingly major price rise. At £15,675, the new Cooper D hatchback, for example, is more than £500 dearer than the model it replaces and there are similar rises in the Clubman and Convertible ranges. Perhaps more significantly, it's also over £1000 more expensive than the petrol-engined Cooper, which arguably has more character, is quicker to 60mph and still does over 50mpg. Unless you do an awful lot of miles, you'll struggle to justify that kind of price difference in lower fuel bills.